We have two tiny houses and they are located on our vineyard on the west side of Paso Robles. We have the "Vineyard Cabin" and the "Cowboy Cabin"
You can rent each cabin separately or rent them both! Wake up to gorgeous views of the vineyard and enjoy wine country at its best. 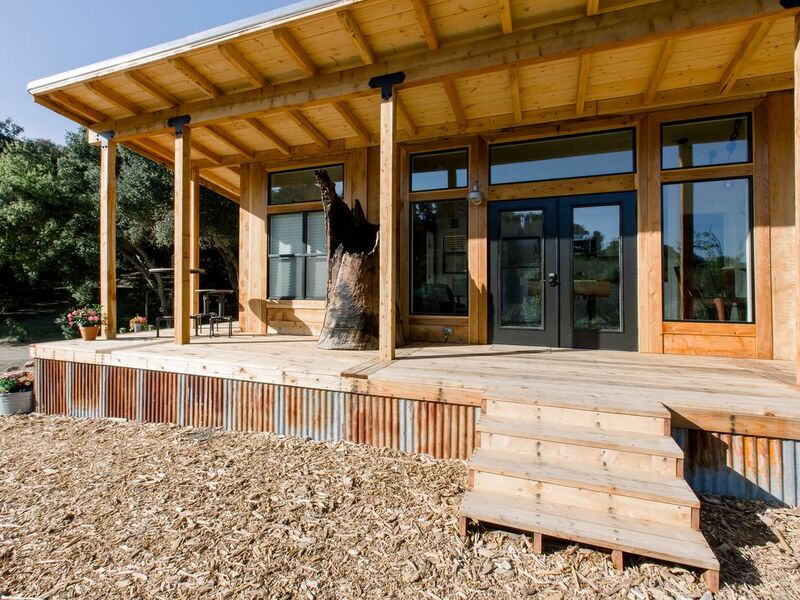 These cabins were designed by Danial Woodsland in Paso Robles. They used their creative imagination and re-purposed our old wine barrels, used old industrial parts in innovative clever ways and created furniture from old trees from our property. We have furnished the cabins with storage in mind! The queen bed has drawers to put your clothes and the walls have hooks to hang clothes. A very unique experience! We can accommodate 6 people per cabin if you like to snuggle, the sleeper couch is a double bed. We began growing our award winning Chardonnay grapes in Malibu. But In a quest for outstanding reds, we discovered Paso Robles. In addition to our vineyard in Malibu we have also acquired 140 acres in the heart of the desired Willow Creek Ava in Paso Robles. High on the top of a hill with breadth taking views and perfect calcareous soil, we have added Cabernet among 8 other varietals to our wine growing library. Not only have we been selected Micro Winery of the year in 2012, through the years our Cabernet's have achieved best of class, double golds and selected as the “The new King of red” by Sunset Magazine. Given the opportunity, don’t miss the chance to take in the views at our ranch, make an appointment with Nancy our onsite host. Or visit our new tasting room in downtown Paso bring your complimentary tasting tickets! The Hoyt family hopes you enjoy our wine as much as we enjoy bringing them to you. Thank you for the excellent weekend. Our Daughters enjoyed feeding the goats and we all had a great time touring the vineyard. This was a clean and private cabin that allowed us a relaxing stay. We will definitely stay with you guys again.